A Pune based company with commitment to the highest level of customer satisfaction for business initiatives involving .NET Software Development domain. Our .NET Development Solutions help enterprises and technology providers build Gen-Next software and applications using .NET as the core platform. Dot Net software framework developed by Microsoft that runs primarily on Microsoft Windows. .NET programs run at native speed making them faster and more efficient. It facilitates Internet services such as creation, hosting, managing, and providing of Internet services to businesses and consumers. Basically, there is a lot of stuff that can be built on top of .NET with the help of right .NET developers. Why Hire .NET Developers at WMS? 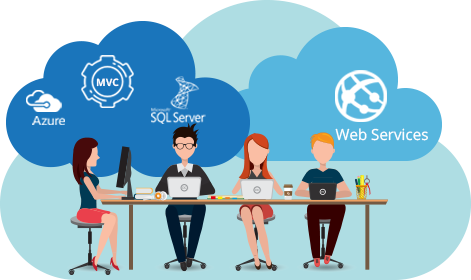 WMS developers and programmer are hosts of proficient knowledge of asp.net, vb.net, c#.net along with other required dot net development environments. With us, you can hire .net developer and hire .net programmer as per your time and efforts requirement. WMS has an array of expertise in working on diverse business environments. It enables us to utilize the best practices in business and implement proven methodologies. Our developers use powerful templates and customizable tools to create marvellous enterprise solutions. We are exceptionally skilled at creating a plug-in for your application that not only works wonderfully but also provides a great platform. Working knowledge of OOPs, OODs & My SQL coupled with understanding of MVC Frameworks. That is what makes our developers the best at .NET.